Wednesday 24th April was a good day for Executive Jets mainly due to the Man United v Man City game at Old Trafford in the evening. The pick of the pile was Chinese Gulfstream 550 B-8297 seen arriving on Runway 23 Right: Photo - Peter Hampson. The “Star of the day” - Gulfstream 550 vacating runway 23 Right on 24th April. Mike Oldham from the RVP. Challenger 300 SE-RNR making it’s first appearance at Manchester on 24th April.Photo:Peter Hampson. Gulfstream 550 N721KJ was photographed from the RVP mound by Mike Oldham on 24th April. Wednesday 24th April and Citation 525 M2 M-KNOX touches down on 05R for it’s First Visit to MAN. Peter H.
CS-PHL Embraer Phenom 300 looked good on short final.Peter H.24th April 2019. Monday 22nd April was another perfect morning for photography! Virgin Atlantic’s A340-600 G-VNAP striking the pose on 23 Left for it’s departure to Heathrow after undertaking a “rescue” flight last night from Atlanta for one of our own 747’s which had “gone tech”. A big thanks to Stuart Prince for the photo! Vista Jets big boy Challenger 850 9H-ILB lines up for departure on 23 Left . 22nd April 2019. Photo Chris Boyde. Lear Jet 45 LN-AWB is seen taxiing out for a runway 23 Left departure on Monday 22nd April. Photo Chris Boyde. After the arrival comes the departure…Kuwait Air Force C17 “343” lifting off from 23 Left on 20th April. Photo: Jonathan Ingham. Time to go! Lining up for departure on Runway 23 Left a dramatic shot from Stuart Prince. 20th April 2019. C17 KAF 343 just prior to departure on Saturday 20th April. Photo;Lawrence Brindley. C17 Globemaster KAF 343 on final approach to Runway 05 Right at Manchester - 19th April 2019. Mike Oldham was one of many at the Runway Visitor Park who captured Kuwait Air Force C17 “343” in the Manchester Blue! 19th April 2019. Global Express N565RS looked very good touching down on 05 Right. Full credit to Ross Fearn 19th April 2019. Embraer Phenom 300 D-CDAS was photographed by Steve Ashworth en route to the ramp having vacated 05 Right on 19th April. Citation 680 CS-LTJ was very nicely captured by Ross Fearn on short final to Runway 05 Right.19th April 2019. Embraer 145 F-HRAV contrasted nicely with the Spring foliage breaking out on the trees in Mobberley. Friday 19th April 2019. Saturday 19th April was a fantastic morning for photography. Paul Rowland nicely captured Virgin’s B747-400 G-VAST on rotation from Runway 05 Left. A superb shot from Jonathan Ingham of Challenger 604 D-ANTR landing on Runway 05 Right this afternoon (Saturday 19th April). The former Manchester Tower provides a good back drop for Steve Ashworths photo of a departing Helvetic E190 HB-JVO on 19th April. Air Transat’s A310 C-GTSH making contact with Manchester’ runway 05R on 19th April. Photo; Jack Crompton. Ethiopian operated B777-200LR ET-ANO on their 728 service from Addis via Brussels today (19th April).Photo: John Wood . Air Transat returned A321 C-GTXF to Thomas Cook on 17th April (following her Winter lease).She is pictured on short final to 05 Right. Thomas Cook are currently operating A330-200 G-TCCG with Condor titles and logo on the winglets out of Manchester.Photo with thanks to Jack Crompton. Gulfstream 650 VP-CZA was nicely captured on approach to a sunny Manchester on Wednesday 17th April. Vueling A320N EC-MZT making her first visit to Manchester on Monday 15th April. “Tower good afternoon Etihad 021 is with you,vacating 05 Right”. Many thanks to Paul Robinson for capturing the moment! History in the making - 15th April 2019. A6-APD was nicely captured in the late afternoon sun from the RVP Mound by Mike Oldham..
Royal Air Maroc E190 CN-RGO just prior to touch down on 05 Right 15th April 2019. “Good morning Manchester” - Cathay Pacific’s A350 B-LRB touching down at Sunrise on 13th April. Photo:Jonathan Ingham. A superb shot from Karl Thurston of Legacy 500 G-WLKR touching down on 05 Right on Saturday 13th April. Hawker 800XP G-XSMC touching down on 05 Right on 13th April. With many thanks to Karl Thurston. United B767-400 N66057 leaving a few rubber deposits on Runway 05 Right! Photo: Jack Crompton 13th April 2019. An excellent image of Aurigny ATR 72 G-COBO on short finals to 05 Right on 13th April.Photo: Karl Thurston . A great image with plenty of presence! KLM Skyteam Livery B737-900 PH-BXO rolling out after landing on 05 Right.Photo: Karl Thurston. A beautiful shot of a beautiful aircraft from Steve Ashworth - Gulfstream 650 N829AR at Manchester on Thursday 11th April. Gulfstream 550 N757PL is captured on very short finals to Runway 05R on 10th April. If there are football flights anywhere the chances are that Enter Air will probably be involved for one of the teams! 10th April at Manchester and Barcelona fans it was with Boeing 737-800 SP-ENR providing the transport on this occasion. Photo:Debbie Riley. A beautiful shot in the Spring Manchester sunshine by Debbie Riley. Legacy 650 D-AFUN touches down on 05 right bringing in more VIP’s for the match at Old Trafford on 10th April. TUI A321 CS-TKU was utilised to transport Barcelona supporters to Manchester on 10th April 2019. Beechcraft Premier 1 RA-02799 was without doubt one of the star visitors from this weeks football flights. It was captured very nicely from the RVP Mound by Mike Oldham on 10th April. Air Transat A310 C-GTSH was caught leaving it’s mark on Runway 05 Right on 10th April. Photo Peter Hampson. Airbus A318CJ M-HHHH arrived from Moscow (Vnukovo) on its first visit to Manchester on 9th April. Photo: James Fairbrother. Tuesday 9th April - Iberia A330-300 EC-LUB is captured touching down on Runway 05R with FC Barcelona on board for their game with MUFC at Old Trafford on 10th April. A superb shot by Andrew Jennings of Falcon DF 2000 LX-EVM on Runway 05 Right 6th April 2019. 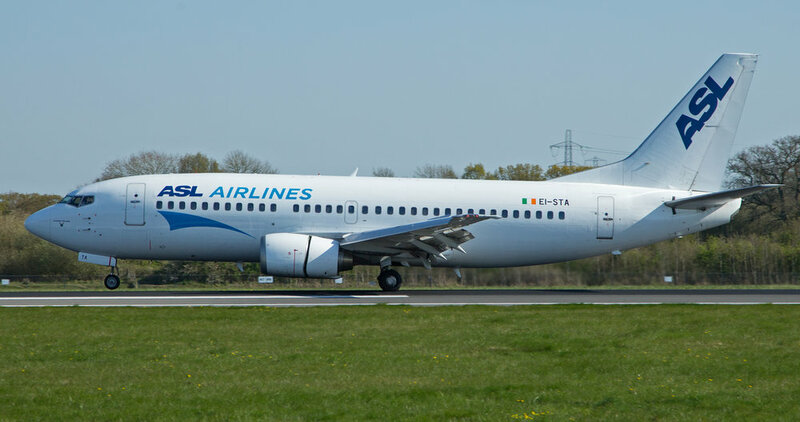 RAM B737-800 CN-RGG in the “Wings of Africa” livery is seen rolling out on 05 Left.Photo: Mike Oldham 5th April 2019. Turkish Airlines operated A330-200 TC-LOH on the TK1995 from Istanbul on 5th April.This was the aircraft’s “First Visit” to Manchester. Captured here from the RVP having just vacated 05Right. Photo: Mike Oldham. Fosfa “We live to give” Beech Jet 400 OK-PPP looked good despite the dull Manchester weather today (5th April 2019) Photo: Mike Oldham. The Styal shrubbery provided a very nice back drop for Citation 525 CJ3 CS-DVJ today (Friday 5th April)..perhaps there is hope for photographers at the RVP after all ? Photo: Mike Oldham. Air Transat A321 C-GTXO was captured in the evening sun on finals to Runway 23 Right on Wednesday 3rd April. The aircraft was returning to Thomas Cook at Manchester following its Winter lease. Photo: Peter H.
A321 LY-NVU arrived from Montpelier on the evening of Wednesday 3rd April. Captured on finals to 23 Right the aircraft is formerly G-OZBZ of Monarch. Photo:Peter H.
Falcon 900EX N900SN was one of several executive jets which visited on 3rd April. Mike Oldham photographed her from the RVP as she vacated Runway 23 Right. KLM are currently operating a variety of different aircraft types on their Manchester services. Mike Oldham captured B737-900 PH-BXO in the Sky Team livery operating the morning KL1074 to Amsterdam on Wednesday 3rd April. Turkish Airlines A321 (TC-JRO ) is seen here in the Euro League Livery lining up prior to departure from Runway 23 Left to Istanbul on the TK1994 . Photo : Mike Oldham - 3rd April 2019. Many thanks to Chris Boyde who ventured Southside this morning (2nd April) to capture the first visit to Manchester of a Joon A321 . F-GTAJ was operating for Air France on the AF1668/9 from / to Paris CDG. Qatar Cargo A330-200F A7-AFY arrived for work with Air Livery on 1st April 2019. The aircraft is expected to depart in the colours of Sichuan Airlines China. United Airlines changed aircraft types today (Sunday 31st March) on the Manchester - Newark route.The first B767-400 N77066 is seen departing off Runway 05 Left Newark bound! James Fairbrother took a trip Southside today (30th March) to capture the return back to Amsterdam of the KLM -Asia B777-200 PH-BQF following work with Air Livery at MAN. KLM B777-200 PH-BQF departed Manchester today (Saturday 30th March 2019) following the painting of the aircraft in the airlines new scheme by Air Livery. Photo Andrew Jennings from the RVP. It’s not every day you get a US Navy MH-60 Sea Hawk in Manchester and today (29th March) we had two! 165774 is seen here just prior to landing for re fuel with Signature Flight Support. Euro Wings A320 D-ABDU has been painted in a spectacular livery for Hertz Rent a Car. She was nicely captured by Mike Oldham (from the RVP viewing mound) on departure from runway 23 right on 29th March 2019. Still recognisable in the former BMI colours is Loganair E145 G-RJXC which was seen at MAN on 29th March 2019. Photo Paul Rowland. The Boeing 757 era is slowly but surely coming to an end as United are soon replace their 757’s with 767’s on the Manchester route.Seen here departing to Newark on 29th March is N12623. Photo Paul Rowland. Gulfstream 550 N990NB departs Runway 23R on 26th March. Photo Ron Huzar. A great moment in time captured from Manchester’s Southside by Ron Huzar on 26th March. Seeing double or can you spot the difference? The 10,000th Airbus produced was Singapores A350-9 9V-TMF. she was photographed departing Manchester by Jim Fairbrother on Saturday 23rd March 2019. Citation 525 SP-AST was one of several executive jets which visited on 17th March. Luxembourg registered PC12 LX-JFS arrived with the match officials for the Man City v Schalke UEFA Champions League game at the Etihad Stadium on 12th March. Photo Debbie Riley 11th March 2019. Today’s (8th March) star visitor came in the shape of Qatari Gulfstream 650 A7-CGE. Photo with many thanks to Steve Ashworth. Steve Ashworth paid a visit to the RVP on 7th March and despite the atrocious heavy rain was able to get a pretty decent departure shot of British Airways latest A321N - G-NEOT. Turkish Airlines operated A330-300 TC-LOA on their TK1993 service from Istanbul on Wednesday 6th March. Etihads B787-9 A6-BLG in the Special Olympic World Games livery returned to Manchester again today (5th March).The aircraft was photographed by Mike Grundy after vacating 23 Right taxiing to T1. A great shot from Steve Grimshaw as the BA / BEA A319 G-EUPJ completes its first revenue service wearing its splendid new Retro livery on 4th March 2019. British Airways BEA Retro A319 G-EUPJ paid its first visit to Manchester today (4th March). Alan Moss was at the Runway Visitor Park and caught the aircraft just after landing on 23 Right. Greg Mape caught the BA A319 Retro G-EUPJ from the top of the T1 Multi Story Car Park just prior to landing on 23 Right. Cathay Pacific’s latest A350-1000 B-LXI made its first visit to Manchester today (27th February).The aircraft is seen here departing back to Hong Kong. Photo: Paul Rowland. A great shot from Ron Huzar of Luxembourg registered “Air Ambulance” Lear 45 LX-RSQ powering off Runway 23 Right on 27th February. An excellent shot by Paul Rowland of Brussels airlines A320 OO-SNM departing on 23 Right.27th February 2019. Turkish Airlines operated an A330-200 on their scheduled TK1993/4 Istanbul service on 27th February.TC-LNB in the Star Alliance livery was nicely captured on departure by Paul Rowland. Today’s star visitor was the first visit of KLM B777-200 PH-BQD which arrived this morning (25th February) for work by Air Livery. One of several executive jets which visited for the football at Old Trafford today. Falcon 7X G-CRNS was captured nicely on short finals by Debbie Riley 24th February 2019. Austrian 321 OE-LBD was seen sporting the new Austrian titles on Saturday 23rd February.Jim Fairbrother.